Paul Ferley addresses the IWLA Canadian Council during the 2015 Spring Conference. Members across the border gathered for the annual spring conference April 16, 2015. The event was a great success with good attendance, delicious food, and excellent speakers. We had some of the highest ratings for speakers at any conference in recent memory. 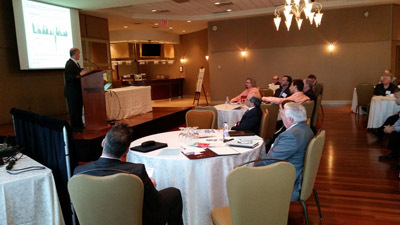 Paul Ferley with the Royal Bank of Canada led the group with his insight on the current state of the global economy. His comments focused on the recent dramatic changes in the exchange rate for the Canadian dollar, the drop in the price of oil and the outlook for what these changes will mean to the Canadian economy and the warehousing and logistics industry. Paul was followed by Sheldon Basch of BDO Canada, who presented the case for the use of cost accounting in ensuring a company’s profitability. Mark Thomas of the Schulich Executive Education Centre at York University gave a review of some of the educational offerings that Schulich provides. In the afternoon, IWLA hosted two panel discussions. The first panel discussed warehouse management system challenges that arise in the sales and implementation cycles when the company acquires a WMS system. The panelists were forthright in their description of the problems that can arise. The second panel presented new strategies for onboarding a customer and ways to developing a strong relationship with a customer. They discussed the sales process, the contract, the procedures and the communications that must take place in order to have a successful working relationship with the customer. Thank you to our speakers and attendees who participated in this event. Read more about this event and other news in the May 2015 E-bulletin.